It’s that time of the year again when we share our beautifully decorated Christmas homes. I’m always giddy about this time of the year because this is my favorite seasons of all. Today’s tour is hosted by the sweet Carrie over at Lovely Etc. And today many other talented bloggers joined forces to showcase their gorgeous homes today PLUS we are giving away $300 CASH! Yay! Be sure to enter for your chance to win that $300 at the end of this post. In today’s tour, I’m going to show you around in my dining room, and I’ll be sharing the rest of my home next week so stay tuned! Around this time of the year last year, we painted our dining room, and it was a needed change to this space. Sometimes a little paint can go a long way guys. I love the dark wall in this space, and I honestly haven’t changed a bit in here since last year. 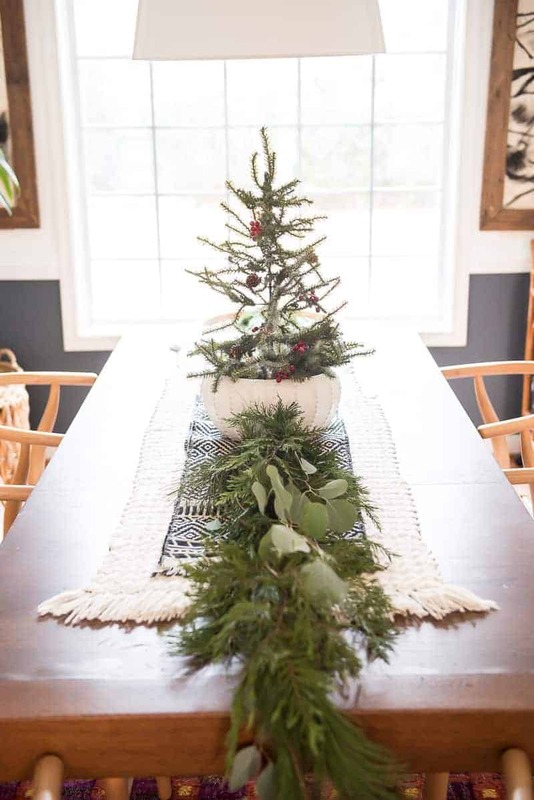 I added a few Christmas greenery on the top of my table, and I got a faux mini Christmas tree from Walmart as a centerpiece, and I think these simple touches completed my holiday decor in this space. Just yesterday evening I created this fun Christmas countdown calendar which I think blends in with the rest of the decor in this room. Hurray! Aniko, I have been following you on Instagram for a few years and I am ALWAYS blown away by your vision and talent. I am again blown away by your simplistic Christmas decor. Thanks for continually inspiring me. The simple touches sure bring in the holiday spirit! It’s really beautiful Aniko and I love your painted walls. The count down advent calendar is really cute! 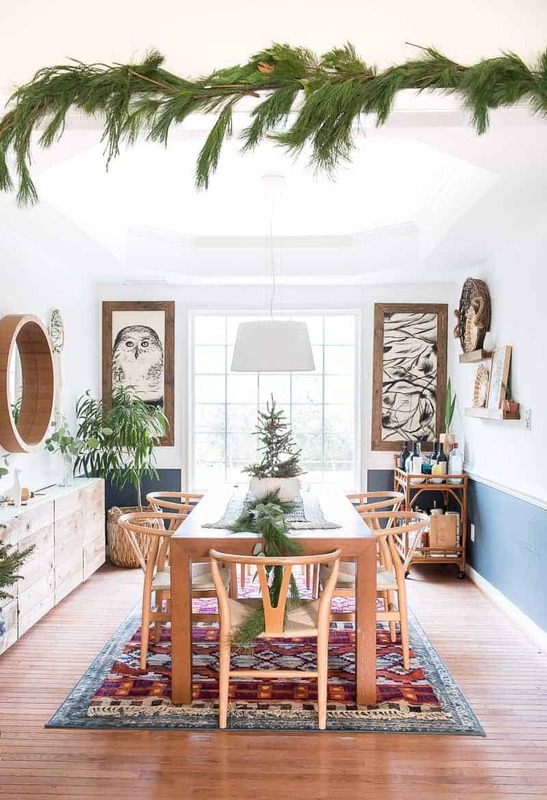 Your home looks so incredibly stunning decked out for the holidays. That Christmas calendar is so precious and blends so effortlessly into the vignette. I’m new to your blog and I’m sure it’s been asked before but where did you get the prints in the dining room? I love your tassel ornaments and advent calendar. The garland on the table looks beautiful 🙂 Happy Holidays! 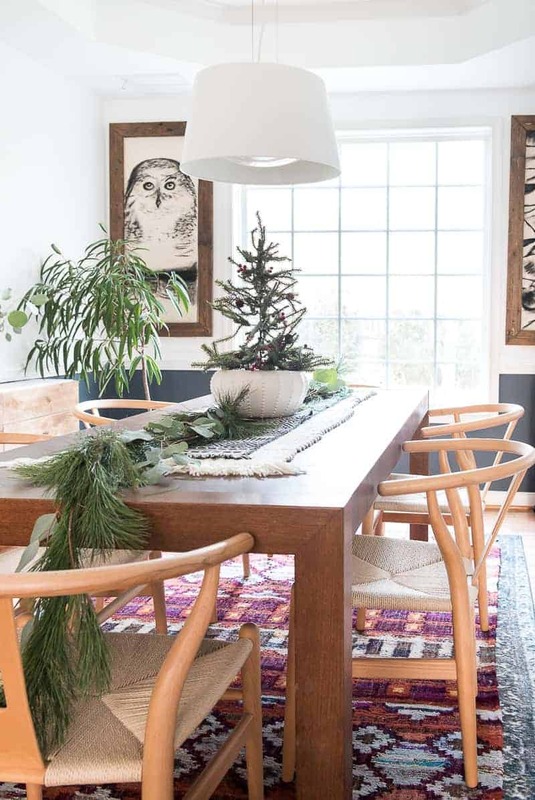 The tree on the table in that planter is just adorable. Gorgeous Aniko! Everything looks lovely – I just love all the fresh greenery and it just blends beautifully with your decor. Now I’ve gotta check that cute advent out. So cute. Also. 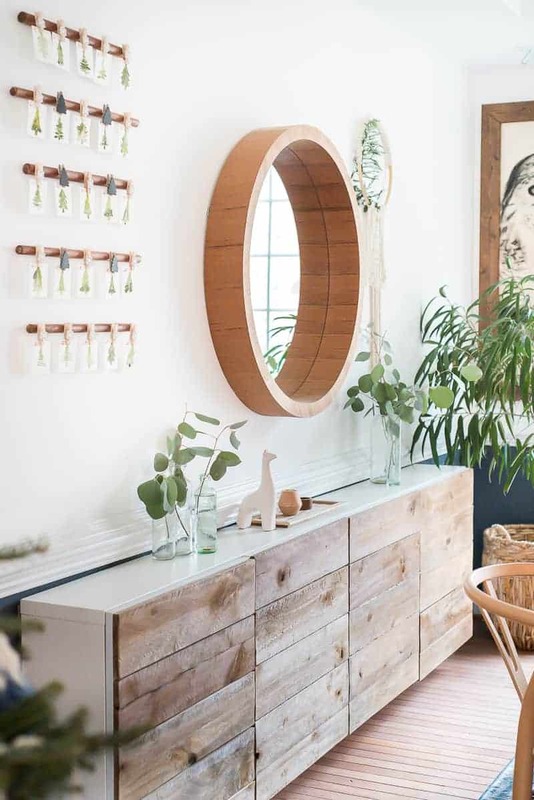 That sideboard is gorgeous. Just beautiful. More info? 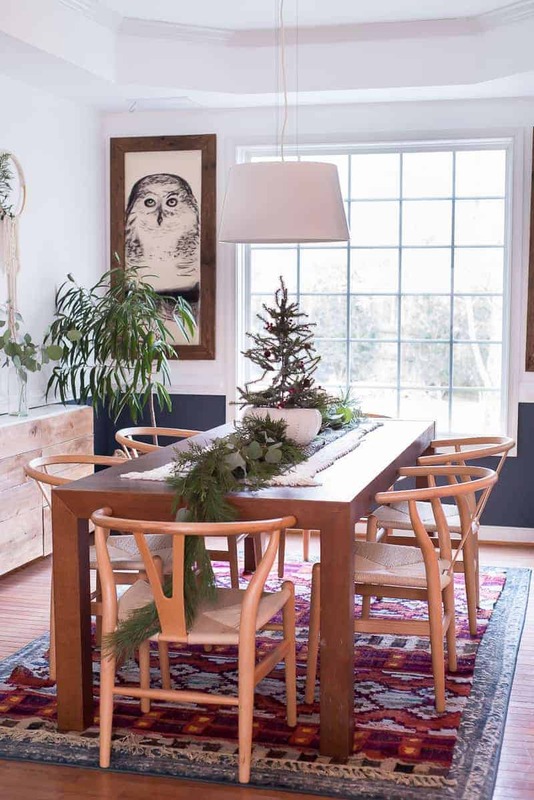 Beautiful Christmas dining room Aniko! Love all the fresh greenery on your table. Spectacular Aniko!! 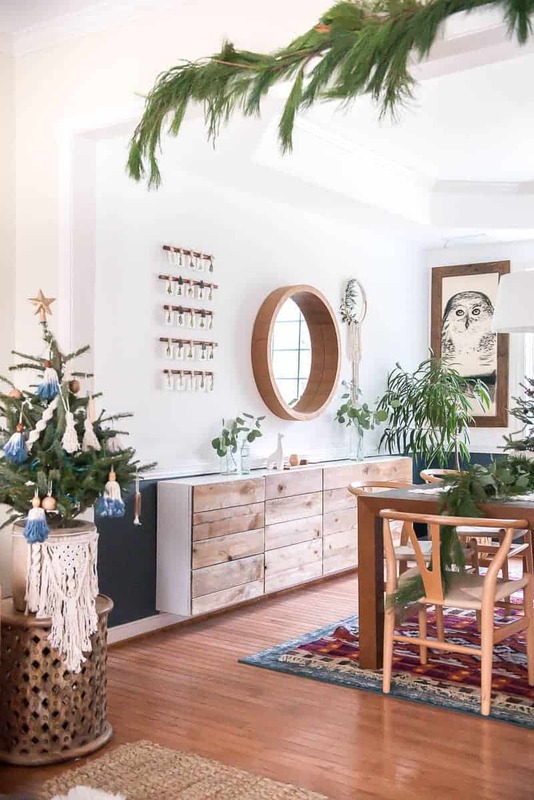 I adore your simple Christmas styling. I’m really feeling simple decorating this season and I’m utterly smitten with this. oops..this is our bliss instagram wasn’t right ( I found her though) Just a heads up! thank you for the giveaway opportunity. I invite you to come by and enter my giveaways too. Hugs! Wonderful dining room decoration dear! This is really important to decor our dining with living room. I was searching for my dining room decor ideas, And here I got some of nice creations! I really enjoyed reading your blog, Keep sharing dear such a sweet ideas with us!